Dauntless Wine Cømpany doesn't have a winery space of its own, but that hasn't slowed down the winery one bit. 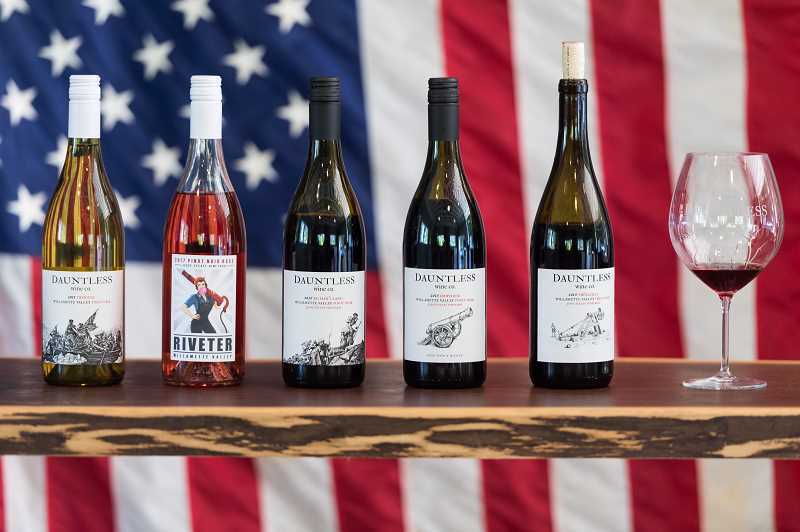 The company already has several awards under its belt, winning "Oregon Pinot Noir of the year" at the New York International Wine Competition last year. Later this spring, the winery plans to open its own tasting room for the first time, taking over a space that has stood empty on Forest Grove's Main Street. Owner Ben Martin grew up in Forest Grove, only two blocks from where the tasting room will be located at 2003 Main St. He graduated from Forest Grove High School in 2001. "We've never have been the typical winery from the get-go, being a little different is who we are," he said. "We haven't ascribed to the norms within the wine industry and we just dove in and figured it out along the way." Without a space of its own, Martin said a tasting room has been badly needed to help draw customers discover Dauntless' wines. Since its founding in 2014, Dauntless has created its product at a few different wineries in the area, most recently ADEA in Gaston. Now housed at Laurel Ridge in Carlton, the winery had no space for a dedicated tasting room. "I didn't think I'd be opening a tasting room here, but this space aligned with our aesthetic and what we want to do," he said. "We have been kind of like a vagabond group being on our third winery in four years." Dauntless hopes to hold soft openings for club members and the wine industry in March and open officially in April to the public. "I've been doing limited by-appointment club pourings," he said. "Everyone loves it. When they come in here they say how beautiful it is. They aren't ready to see these high ceilings. It has a good vibe — every time I walk in here it feels good." Springtime is a perfect time to open, Martin said. 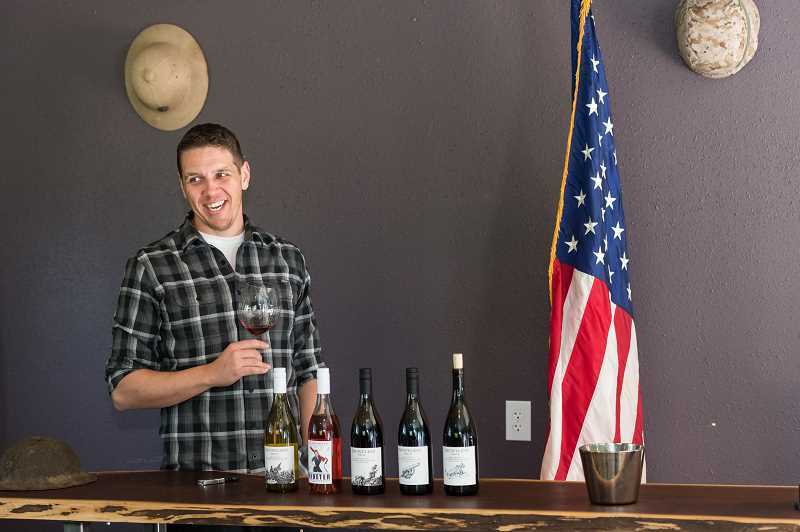 Wine season begins in May, and the tasting room will be conveniently located in the heart of Forest Grove, offering opportunities during city farmer's markets and the town's annual Uncorked wine festival. "I have to think creatively on what products I can offer besides pouring wine," he said. "We are steering clear of the pub taproom business model. 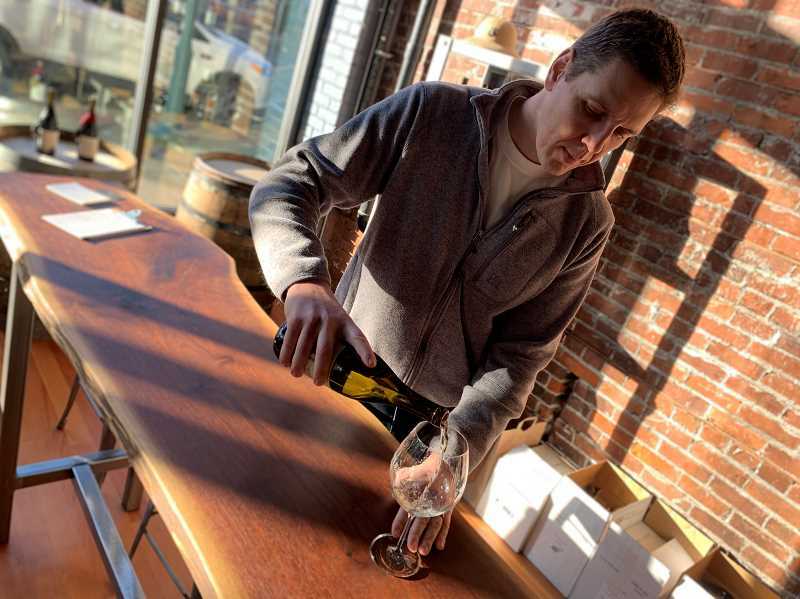 All the wines served will be Dauntless wines and plan to have one guest tap of beer and possibly cider." Dauntless' mission isn't just to serve good tasting wine, Martin said. The tasting room's walls will soon be covered in military memorabilia and art. Martin said he wants to remember the past and support the future. "A lot of these pictures exist out there. They are swept aside," Martin said. "It is important and part of who we are. To remember history, if you don't study it, you can experience the same pitfalls of the past." Martin enlisted in the U.S. Marine Corps in 2001, and was a part of the invasion of Iraq in 2003. Serving for five years, along the way, he became good friends with Marine veterans Ryan Mills and Paul Warmbier, who are now his business partners at Dauntless. Together, the three set out to create a business owned by veterans and to employ and support U.S. veterans. Jesse Estate Vineyards in Cornelius provides the grapes for Dauntless's wine production, with its first crop coming from a late ripening, Martin said. "[The owner] told me to go out and take as much as we can," he said. "We ended up rounding up eight tons and that was our first vintage. We had zero plans to make wine that year but we couldn't pass that up. At that point, I hadn't made wine, I brewed once in my life. We dove in head first and the wine came out pretty good. We were lucky. We wouldn't be here without Jesse Estates." After serving on a board of a veteran nonprofit, Martin was inspired by the French Foreign Legion, who owns a chateau in France where ex-legionnaires make wine. "Legionnaires aren't considered veterans in their respective countries because they are foreigners, so when they go home, they receive no benefits," he said. "The Legion identified that issue and opened the chateau, and I really wanted to adopt that model and connection. I would love to get their wine in here." Martin said he wants to support other veteran-owned businesses, like Ancestry Brewing in Tualatin or Vagabond Brewing in Salem. "I had a lead fall into my lap the other day about a seven-acre vineyard owned by a Vietnam Marine and they want to work with us to potentially help us get an estate going," Martin said. "The original goal was to have an estate that veterans can come back, grow grapes, make wine, decompress and be in a nice environment. There is a lot of studies that show the tactile feel of dirt helps with post-traumatic stress disorder, and there is a lot of probiotics in soil to regulate your mood." When the tasting room opens, not only does Martin want to see it as a space for events and family and friends, but he wants it to become a space for service. "I want them to see what veterans can do for the community," Martin said. "They can continue to serve the community as a whole, especially on the agricultural side. We are members of the Farmers Veteran coalition which helps veterans become farmers. We are going to have a donation table for different charities we like. I want to put a good face to the veteran community."